I am always fascinated and excited to watch Vidya Balan's movies. Though Entertainment is the subject that defines the Movie for the most of the audience, but the magic of life is also an element of Movie to make the world understand the social elemental issues and meaning of life. Wait, am I bringing any complex stuff while writing about Vidya Balan ? Yes..maybe.. let me come back to simple understandings. To face the success you should face the failure and Vidya Balan faced the failures in her earlier days of Cinema. The Charm and luck was strived through filmic debut through Bengali Movie Bhale Theko. Later she debuted in Bollywood through Pradeep Sarkar's Parineetha which gained her critical accolades. If you reminiscent to the classical soap Hum Paanch telecast during your child hood days in Zee Tv, no wonder you shouldn't be surprised to know that Vidya Balan played one of the 5 girls in the soap. I thought to jot down something about Vidya Balan almost from year but glad to write something today to show my gratitude for her acting skills and portrayal of female central oriented roles in films like Paa, Ishqiya, No One Killed Jessica, The Dirty Picture and Kahaani. She is an actor with great talent and the talent is not ruined but gained the critical fame. Boldness is the word that floats in your mind when you watch The Dirty Picture. 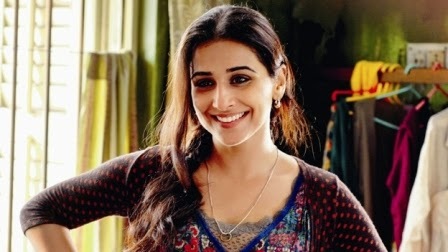 Brilliance and Witty are other synonyms to Vidya Balan if you have watched her performances in Ishqiya and Kahaani. The fancy style, blabbering and audacious punjabi house wife that she portrayed in Ghanchakkar brought the humor through her screen presence.